Wingates is fiercely proud of its reputation as one of Britain's oldest and finest brass bands, and one of the few whose history is totally unbroken since its formation in the middle of Queen Victoria's reign, continuing throughout the traumas of two world wars, and surviving the horrors of the 1910 Pretoria Pit Disaster, which could so easily have seen the demise of the band. As with any organisation with such longevity (the band is now in its 143rd year) Wingates is constantly anticipating exciting new milestones and anniversaries on its long and colourful journey, and no sooner had the dust settled on the major events of 2013 – when the band's 140th Anniversary was celebrated in fine style – thoughts turned to this year, when Wingates celebrates another truly remarkable achievement - namely 100 years of recording the wonderful Wingates music. Following its multiple triumphs in the major national championships just a few years earlier, Wingates remained 'big box office' nationally, and shortly after the establishment of the embryonic and US-owned Regal Records Ltd. in London, Wingates soon became a target for the recording company, who, in mid-1915, brought their primitive (entirely acoustic) recording apparatus 200 miles north to record four of those fragile 10-inch shellac discs, featuring one piece of music per side. Recorded in the bandroom at Wingates Square, these recordings were subsequently advertised and marketed nationally by Regal, with the cost being one shilling and sixpence (7 1/2p) each! Thus began a cherished chapter in the history of Wingates, since when the band has recorded regularly, in a diversity of locations, and embracing all subsequent technologies, including vinyl, cassette tape and compact disc. 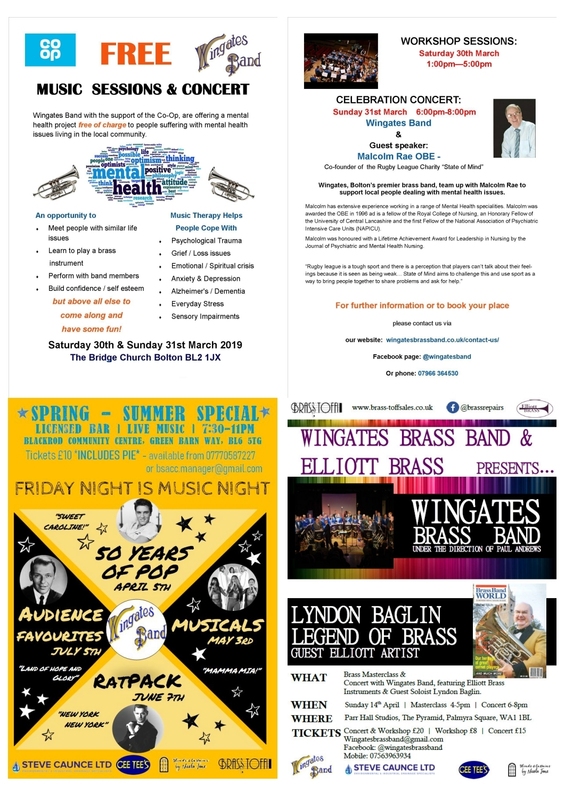 Another fact of which Wingates is immensely proud is that only three brass bands in the world have a longer recording pedigree, with the band's back catalogue now featuring well over 200 recordings of a diversity of types, the majority of which feature Wingates exclusively, with the remainder being with massed bands, choirs, and providing the backing for various solo performers. Determined that such a special achievement should not go unheralded, Wingates have embarked upon a multi-faceted project, under the umbrella title of 'Sounds of a Century'. Unsurprisingly, at the heart of the project is a commemorative CD album, which, most fittingly, as were those 1915 discs, has recently been recorded in the band's home town of Westhoughton – at St James's Church, Daisy Hill. The album comprises 12 tracks, 10 of which have been painstakingly chosen by musical director, Paul Andrews, in order to produce an attractive and balanced programme of music, selected from the innumerable pieces recorded across the previous 10 decades – and what a massive challenge that proved to be for Paul! The selected pieces have been superbly re-recorded by the band of 2015, and the album is 'book-ended' by two brand-new, specially-commissioned pieces, one being a rousing opening fanfare, and the other a blockbuster finale, the full details of which will be announced shortly. In addition to the album, band president David Kaye (who authored the band's definitive history, From Bible Class to World Class, to mark the band's 140th Anniversary in 2013) is compiling an illustrated brochure, outlining the fascinating story of this important chapter in the band's life, in which it is planned to incorporate a comprehensive Discography. Also planned is an exhibition of the band's recording history, featuring vintage gramophones and a large collection of recordings from the band's archives, to be staged at Westhoughton Library later in the year. The main celebration of the 100th Anniversary of the band's first recordings will come on Saturday, 24th October 2015 (7:30pm) when Wingates will perform a concert at St Bartholomew's Parish Church, Westhoughton, at which both the CD album and supporting publication will be formally launched. Press Release, 18th August 2015.